I love growing things in the garden and really enjoyed helping with gardening club at my children’s school last year. The school garden had raised beds and we couldn’t believe how well everything grew. We had bumper crops of peas, sweetcorn and more carrots than we could count. Unfortunately, I’ve not been very successful growing plants at home as we seem to attract a lot of slugs. One year we tried to deter them with a tub of beer, you wouldn’t believe the number of slugs that ended up in the beer tub, but I felt like the beer was attracting them rather than deterring. At school we had less issues as the raised beds were set on stones which the slugs didn’t seem to like sliding over and copper tape worked well on the outer beds. Another way to protect your precious plants from small animals and cold weather is to use a polytunnel! Polytunnels are fantastic for extending the growing season whether you’re growing fruit and vegetables just for you, in a school or even commercially. First Polytunnels have supplied celebrity gardeners including Alan Titchmarsh, Hugh Fearnley-Whittingstall and Bob Flowerdew with their fantastic polytunnels and you could win your own in their brand new competition. 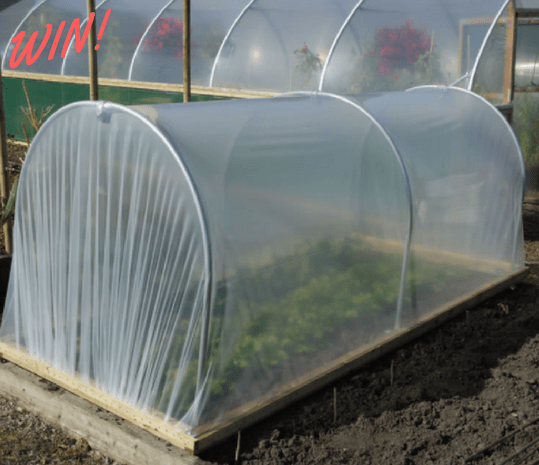 Win your very own polytunnel! First Tunnels have a brilliant competition running where one lucky person will win a fabulous mini polytunnel! (4ft Wide, 10ft long with a cover type of your choice). To enter visit First Tunnels, answer the question and complete the contact form. Hurry, hurry as the competition ends on the 30th of April 2018. The winner will be announced on the First Tunnels website and on their social media channels. Competition is for UK residents only. See the First Tunnels website for full terms and conditions.